These Facebook tab designs were a very fun project for us. Using the WordPress CMS, we created 3 different custom Facebook tabs. All 3 tabs use the same header and footer share section design. Landing tab is the welcome and support tab, using very advanced jquery we created custom drop down menus for the product lines, support and where to buy links. Also included in this tab is a custom slideshow. The 2nd tab is the Worldwide tab. 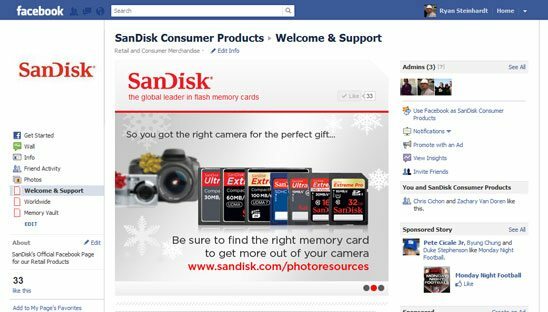 This tab is used to find out where all the SanDisk facebook pages are located worldwide, all created in the same system and using the same menu drop down jquery code. 3rd tab is dedicated to their product “Memory Vault” with a slideshow, video, link to more info and news section.